On Monday, October 23, 2017, distinguished members of the Judiciary, past and present Commissioners, and leading scholars commemorated the original U.S. Sentencing Commission and marked the 30th Anniversary of the Sentencing Guidelines at the Hofstra University Club. 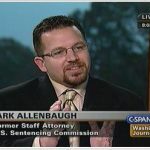 Mark Allenbaugh is co-founder of Sentencing Stats. He is a former staff attorney for the U.S. Sentencing Commission, and a co-editor of "Sentencing, Sanctions, and Corrections: Federal and State Law, Policy, and Practice" (2nd ed., Foundation Press, 2002).